I don’t read much popular history, and that is probably a mistake. By ignoring countless works written for a mass audience I miss what attracts most people to my subject area: a good story that is actually true, or at least could be true, reconstructed from sources scattered all over the archives and joined by creative ingenuity. With historical writing, the lines between fiction and non-fiction are frequently blurred. Academic historians tend to lay claim to objectivity by comparing countless sources and weighing up possibilities and arguments, while novelists might have invested a similar amount of time to research but openly admit that they made up the missing bits and, most importantly, the majority of the action and dialogue. There is some consolation in the fact that for any number of bodice rippers there is probably one Wolf Hall or, an old favourite of mine, An Instance of the Fingerpost, while for any number of bad popular history books, there is one like The King’s Revenge: Charles II and the Greatest Manhunt in British History. Its authors Don Jordan and Michael Walsh, writers, filmmakers and journalists, have done an excellent job researching the fate of the regicides of Charles I, many of whom had to escape from the British Isles at the Restoration of the Stuarts. Some went to the colonies and others to Europe, while those who remained in the country had to keep their heads down or arrange themselves with the new authorities. I’m not sure whether ‘manhunt’ really adequately describes the actions of the new Stuart government against the regicides, as Charles II did not in all cases explicitly sent out the bloodhounds. After all, he had promised to forgive and forget in his Declaration of Breda (1660). Most of his ‘agents’ were shady ‘volunteers’ who aimed for reward or attempted to prove their doubtful loyalty to the new regime, while orders to find and assassinate the exiles more often than not were given indirectly by those close to the King, such as his sister, the Duchess of Anjou, in France, or driven by a vengeful Parliament of angry Cavaliers. I never thought I would see Algernon Sidney on TV. Now I have – on the recent Channel 4 drama New Worlds, which looks at English radicalism during the Exclusion Crisis. He is cast as the grand old man of republicanism (Donald Sumpter, made to look much older than Sidney’s 60 years) who has survived Civil War, Interregnum and Restoration to pass on the torch of the “good old cause” to the next generation. “Let this hand be an enemy to tyrants”, says Abe Goffe (Jamie Dornan) to Ned Hawkins (Joe Dempsie), as they link theirs before the latter returns to right the wrongs in the Massachusetts Bay Colony in the New World, while the former, the fictional son of the regicide William Goffe (James Cosmo), who died across the Atlantic, is determined to set an end to the Stuart monarchy in England. The words written by Sidney into the visitors’ book at the University of Copenhagen in 1659, have become the motto of the new generation. Nevermind that he originally wrote them down in Latin, “manus haec inimica tyrannis”, they now stand for the young radicals’ hatred of monarchy (and would later become the official motto of the state of Massachusetts in the USA). Yet, Sidney himself has mellowed. When Abe goes to meet him for help and advice in episode three, Sidney is no longer keen to rid the world of all kings, he wants to subject them to parliamentary rule to avoid another Civil War. 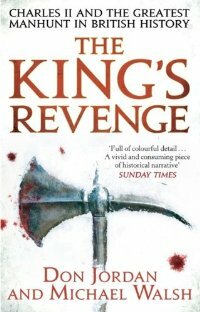 So Sidney and Goffe get involved in the Rye House Plot to kill Charles II (Jeremy Northam) and his younger brother James, Duke of York (Samuel James), as they are travelling back from the races at Newmarket to replace the King with the Duke of Monmouth (Tom Payne) as a constitutional ruler. When the plot is foiled and discovered they are arrested at Sidney’s home and taken to the Tower. The papers seized from his desk, the manuscript of his Discourses Concerning Government (published posthumously in 1698) are used in evidence against him to prove his hatred of monarchy and murderous intentions. Thus he has to die the death of a traitor in episode four, swearing off violence before he departs from this world, while Ned smuggles his writings into Boston, from where they inspire a new generation of Americans hoping for indepndence from Britain. While most critics found the much anticipated New Worlds badly written, soulless and disappointing as the sequel to the amazingly popular Devil’s Whore by the same creators Peter Flannery and Martine Brant, I was most interested in the historiographical aspects of the four-part series. The Whig myths around the regicides seem alive and well outside the world of academic history. William Goffe is confirmed as the Angel of Hadley, who defends the English settlers from an attack by Indians before jumping to his death, while Algernon Sidney is confirmed as the mellowed republican and respectable defender of constitutional monarchy, brought to the scaffold by a cruel and unjust government. As a historian I was also somewhat disappointed that the creators of New Worlds found it necessary to introduce two very contrived love stories, between Abe Goffe and Beth Fanshawe (Freya Mavor) in England, and between Ned Hawkins and Hope Russell (Alice Englert) in the colonies, to get their audience interested in one of the most exciting periods of English history. While I enjoyed some of the period detail and was pleased to see that there are film-makers who share my passion for the seventeenth century, I nevertheless think that the original sources tell the most exciting stories, and that someone should be bold enough to produce a historical drama without artificial enhancements and changes to the original plot. Seventeenth-century history as reality TV, a documentary filmed as drama, now that would create truly new worlds. Unflattering mug shots are now part of most library cards. I collect library cards like badges of honour. I’ve got some I’ve had for a long time – from the British Library, the Bodleian and an out-of-date one from Cambridge University Library. Of course, I also have a CARN (County Archives Research Network) ticket and one for the National Archives. 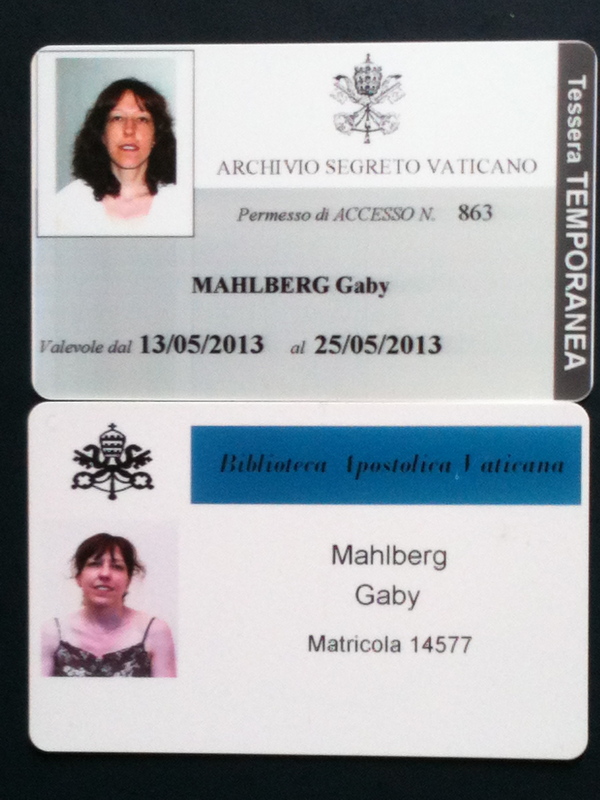 More recently, I have also acquired some foreign ones from the Bibliothèque Nationale in Paris, the Anna Amalia Library in Weimar, the Archivio di Stato in Florence and the Archivio Segreto and the Biblioteca Apostolica in the Vatican. It’s like collecting stamps, just sadder – and the picture, if there is one – is always of me. In the age of digital photography this means I have also acquired a collection of unflattering mug shots of myself, though some of them have admittedly been taken in nice locations. ‘That sounds like a film’, a friend of mine responded when I told her I was off to the archive again, ‘chasing Sidney in Kent’. That’s true. In fact, I am surprised nobody ever did make a film about Algernon Sidney – or at least I am not aware of one. He clearly is the sexiest of the English Civil War republicans I have been studying for the past few years, and this is not just down to his long wavy hair and striking profile. Algernon Sidney, republican fireband (1623-83). As both John Carswell and Jonathan Scott have shown in their biographical works, Sidney was a republican firebrand, a hard-done-by younger son of proud and powerful gentry origin and a conviction politician with a hatred of tyrants and a very short fuse. This short fuse left bridges burnt, while an uneasy mixture of pride and financial hardship, especially during his exile period, meant Sidney was ‘never a man to leave a feeding hand unbitten’ (Worden). Born in London in January 1623 as the second son of Robert, earl of Leicester, and his wife Dorothy Percy and raised at Penshurst Place in Kent, Sidney never quite forgave his older brother Philip for his prime position in the family; and historians dabbling in a bit of popular psychology have been eager to suggest that his rejection of hereditary monarchy and in particular primogeniture, so eloquently immortalised in his Discourses Concerning Government, were not just a refutation of Sir Robert Filmer’s Patriarcha (1680), but much more personal indeed. 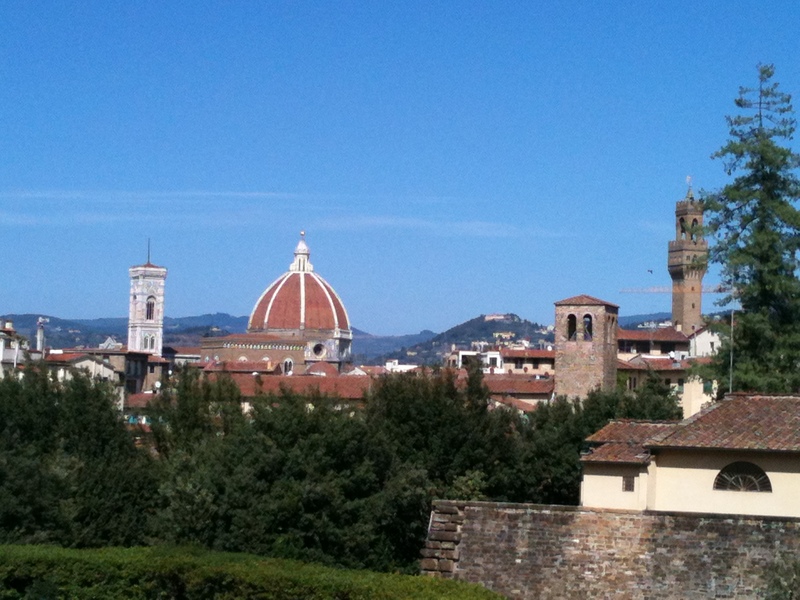 View over Florence from the Boboli Gardens behind the Palazzo Pitti. Why would a protestant English republican take refuge at the Tuscan court? The answer does not seem obvious. Ferdinando II, Grand Duke of Tuscany when Henry Neville made his way to Italy in 1664, was a staunch Catholic as well as a prince. 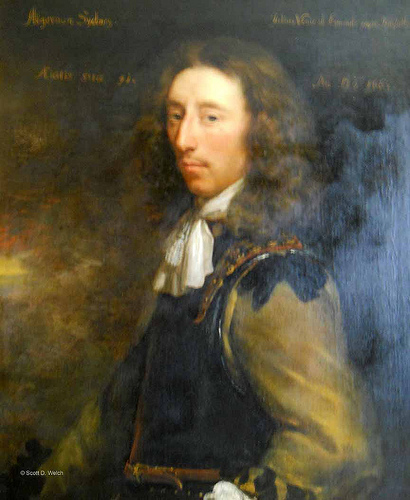 The Civil War republican Neville (1619-94) was known for his unorthodox views and libertine leanings and accused of ‘atheism and blasphemy’ in Richard Cromwell’s Parliament of 1659. He had to leave England after a period in the Tower for his alleged involvement in the Yorkshire Plot of 1663, and Tuscany and the Florentine court in particular seemed like an ideal place for him to withdraw to. 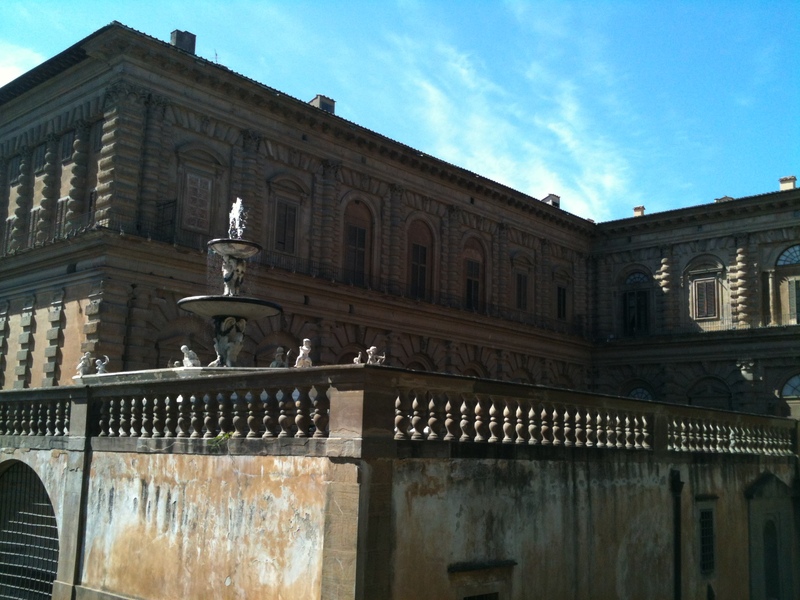 Palazzo Pitti in Florence – residence of the Medici Dukes from the 16th century onwards. Neville had been to Florence before. He had travelled to Italy on his Grand Tour between 1641 and 1645 and acquired friends that would serve him well during his second stay in the country. He was fluent in Italian, as his correspondence reveals, and he was an admirer of Machiavelli and of the Italian city states – notably Venice, which he also visited during the 1660s. And, as he wrote to his brother Richard from Florence in 1665, he found ‘a sensible difference between being civilly treated, … valew’d and esteem’d by princes abroad, and not only hatted but persecuted at home’. If persecution in England was his hell, Italy was his ‘paradise’. Besides, as I have argued elsewhere, neither the hostility between republicans and princely rule, nor the enmity between Protestants and Catholics were as strong as much secondary literature implies. Neville seems to have moved in Italian high society, he had contacts to the Accademia del Cimento, and – like his cousin and fellow republican Algernon Sidney – he was also well connected among the cardinals in Rome. 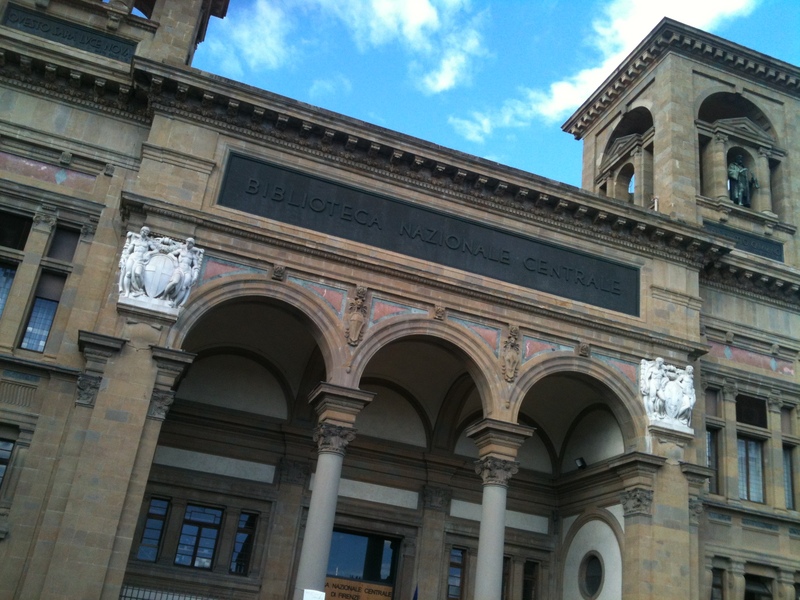 The Biblioteca Nazionale Centrale in Florence (just because it’s prettier than the Archivio di Stato). Rome was a city Neville liked to refer to as ‘Babylon’. It was certainly not holy. He thought it made up in entertainment what it lacked in ‘devotion’, and for him it seems to have been a place for various amorous adventures as well as the hub of Catholic politics. It would be naïve to say that European Catholics and English republicans could not be allies. After all, they had a shared a common enemy in Charles II, and my enemy’s enemies are my friends. This is certainly an area I will further inquire into as I look more at the English republican exiles in Europe. In the meantime, having spent a week in Florentine archives and libraries as well as wandering around the city, the palazzi, squares and gardens, I also have an alternative explanation for Neville’s choice of exile: Florence is just a beautiful place.